This is hardly news, in the sense of 'new news,' as it happened better than six years ago, but Canada's Driftglass had it's origins in another progressive metal band, Dissident Saint. They released a rather delightful album in 2007, The Rise. Now Driftglass emerges with their first album, All That Remains, and a new lineup of band members. 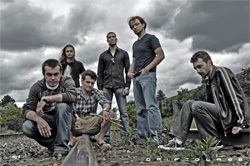 While it's not fair to call this Dissident Saint part two, Driftglass definitely continues their pattern of creating melodic progressive rock and metal, perhaps leaning more towards the latter. It's more a contrast of the two. At the start, Insect in a Jar has friendly accessible rock groove while the following Thrown Out to Shore, moves by the strength of some sharp riffage, then capped off by blistering guitar solo. This in turn is followed by Evelyn, a melodic rock number driven by a crisp and eloquent piano line. It's quite the pleasing song. Later, something similar arrives with the more subtle and gentle Disconnected. Here the piano is infused with some acoustic guitar and the vocal arrangement includes a light female touch from guest Polyna Firer. Again, this is another piece of prog ear candy. 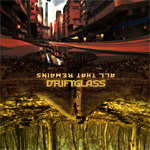 On several songs Driftglass tries to throw you a curve at the start. Both Devil of My Dreams and My Last Lament have lighter starts before jumping into some of that sharp riff driven progressive metal heard earlier. With the former it's an acoustic guitar under a gentle guitar solo, the latter begins on a symphonic movement. But the riffs swell and the drums rise on both with Devil of My Dreams sounding somewhat like progressive power metal at times. All That Remains finishes with a trilogy of songs under the title Dawn To Dusk. Perhaps there's a concept or story here. What you do have is what very may be the 'meat' of the album. The Rise, The Unfolding, and All That Remains display some of Driftglass' best prog chops. The Rise offers some spry keyboard work in tandem with the guitar riffs, with steady drums undergirding all. The Unfolding, the longest of the three, offers a series of contrasts, lighter moments against sharper heavier ones, like the sharp riffs and chugging drums followed by the delicate piano after the half ways point. Finally, the title track felt somewhat clumsy from the start, lots of riffs and drums trampling the vocals. Yet things settle down later, becoming more interesting, as the songs breaks for some light symphonic synths before the guitar leads continue. Perhaps the question that you may ask now, especially if you have some familiarity with Dissident Saint, is this band and album better than the previous? I don't know if the question is relevant. All That Remains both continues the tradition and stands on it's own merits by offering fine and entertaining melodic progressive metal. It's worth your time and interest. Recommended. Driftglass' All That Remains stats true to the band early origins, offering intriguing and entertaining melodic progressive metal.